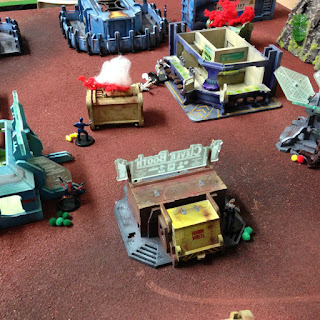 After a bit of a hiatus from sci-fi skirmish gaming, I had a game of Rogue Stars, using the WoTC Star Wars miniatures with Martin at the Sutherland Shire Gamers. 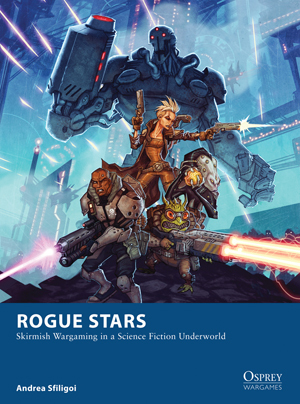 Rogue Stars are a very interesting set of rules, as they are a complete revamp of the original Songs of Blades and Heroes activation mechanic. They use a d20 rather than a d6, have increased interactivity with reaction moves, and you can continue with your turn, even if you roll multiple failures. 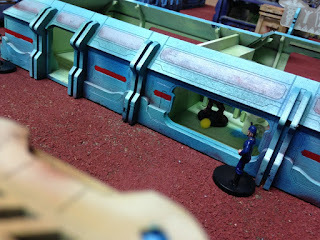 A stress mechanism ensures, however, that you cannot continue indefinitely, and the opponent will eventually seize initiative and start their turn. The two sides were a force of Star Cops (Imperial stormtroopers with some Bespin security) against Pirates (a rag tag force lead by Lando). An abduction mission was rolled up, so the stormtroopers had to capture Lando. The setup is to the left. Lando is in a bar with a couple of gang members, a wookie and a Rodian armed with an assault rifle. The building was already surrounded by two Bespin cops. The stormtroopers were still on the baseline, and a couple more pirates were in other buildings. Unfortunately for the pirates, a Bespin cop got a clear surprise shot on the wookie, who failed to react. This caused a wound and a crippling of the shooting arm. 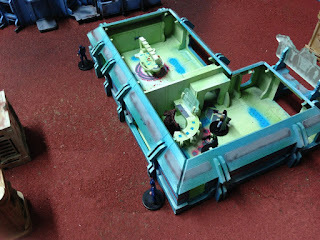 However, this was as good as it got for the space cops, as the Rodian with the assault rifle put the Bespin trooper OOA. The stormtroopers, who were moving up in support, suffered badly on the morale roll. The Rodian was able to put another OOA (shooting first) allowing the pirates to escape off the table, and Lando being able to escape. We played a second game, this time it was a Destroy Property mission, where the stormtroopers had to blow up 6 different structures. Interestingly, on the location roll, it was the defenders home planet, giving the pirates a bonus to morale, so the narrative fit nicely. This time around, the stormtroopers won, with the image below showing some of the burning structures.